Is your bling looking a bit dull? Ring down the sink? Trust me, over the years I’ve had all the dramas! 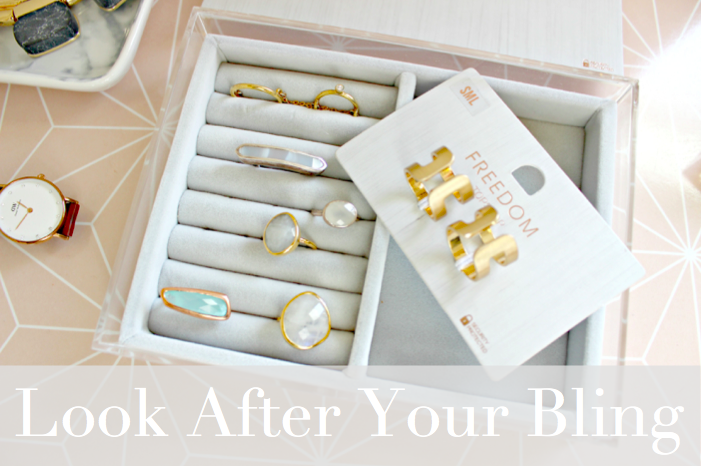 So if you’re in a Jewellery SOS, here are my tips to find the fix. My jewellery is looking so dull! Costume jewellery (not fancy dress shop jewellery, just the cheaper kinds you can get from the likes of Topshop etc) is usually brass or copper with a thin layer of silver or gold over the top. This tarnishes over time as the air oxidises it. Even ‘real’ jewellery will tarnish as pure silver and gold are very soft. So the solution is to store in individual zip locked bags. Its a faff, but for a precious piece it’s worth it. If something’s lost it’s shine, you can clean it up with lukewarm water and washing up liquid. For dirty pieces, use a jewellery polishing cloth or drop in a pot of silver dip. If your jewellery has a copper base, this could react to the acidity levels in your skin. If you get a little sweaty such as under a ring or watch, you might notice it, but don’t worry, it isn’t dangerous. You can stop it by painting a thin layer of clear nail varnish on the surface that touches your skin. Is completely stuck! Find a piece of stretchy elastic (you can cut a rubber band) and wrap it tightly around your finger, moving from the nail toward the ring. When the elastic is close to the ring, push it underneath with tweezers and catch it on the other side. Then wind the elastic back toward your finger tip and the ring will come off too! Broken Clasp – You can buy cheap replacements for hook fasteners in online craft stores. Find the loop thats broken, then use tweezers or blunt scissors to open the ends, and insert the new clasp. Loose Gem – If it’s not expensive (don’t do this with diamonds!) then you can do it yourself with special glue from craft and hardware stores where you mix two parts together, and can dab a small amount onto the gem using a toothpick. Never use superglue as it dries with a frosty white finish. Tangled Necklaces – use two pairs of tweezers instead of your fingers to untangle. It’s much easier! Do you have any Jewellery tips to odd?